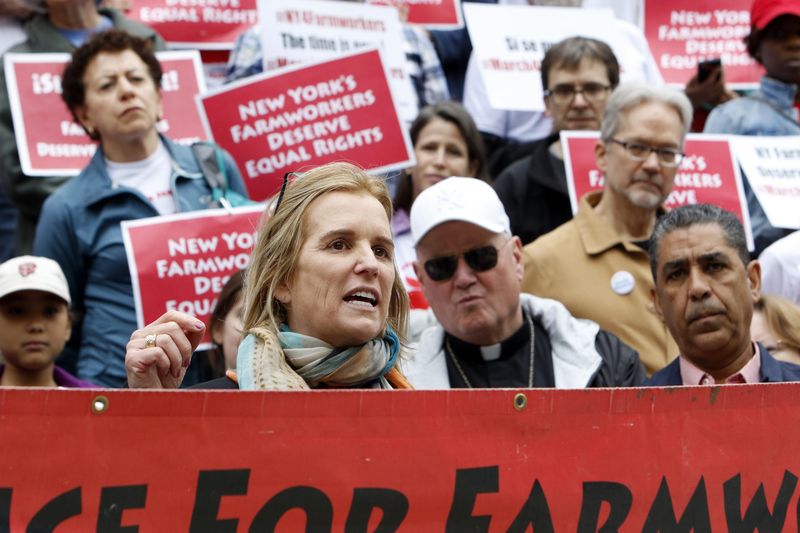 Human rights activist Kerry Kennedy speaks at a rally, May 21, 2016, at New York City Hall during the March for Farmworker Justice (CNS photo/Gregory A. Shemitz). These days, a 19-year-old—or anyone in the private sector, for that matter—with a union card is a rare creature indeed. Union leaders call this the “seven percent problem,” a reference to “the percentage of private sector American workers who belong to unions,” Jonathan Rosenblum writes in his feisty, provocative book Beyond $15: Immigrant Workers, Faith Activists and the Revival of the Labor Movement. Rosenblum is a veteran labor organizer, and a sizeable chunk of this book chronicles what he dubs the first successful campaign for a $15 hourly wage in SeaTac, Wash.—so named because of its proximity to Seattle-Tacoma International Airport. You will learn as much as you ever wanted to know (and much more) about the airline industry and its cozy relationship with Congress in Rosenblum’s book—but he is also after something bigger. In the SeaTac struggle, Rosenblum identifies problems—and potential solutions—for the struggling American labor movement. “There’s no shortage of pundits and elites...who conclude that because inequality is inevitable in modern-day capitalist society, political and social justice activists should content themselves with promoting policies that merely cushion the blow for workers and communities,” writes Rosenblum, who disagrees emphatically. The November 2016 election is not mentioned in Rosenblum’s book, but an obvious question arises in light of it: If so many millions (if not quite a popular-vote majority) are willing to elect a blustering personification of capitalism as president, then is this really an opportune time to talk about upending American capitalism? Especially when Donald Trump may have actually won the union vote in key states, like Ohio? If there is much to debate about Rosenblum’s solutions, his analysis of the problems facing labor is insightful and sound. Two important forces for change are alluded to his subtitle: immigrants and religious leaders. “Too often union organizing campaigns focus exclusively on the economic and political dimensions of the fight,” Rosenblum writes, thus muting the “moral voice” of faith activists. Which brings us to an even thornier aspect of Rosenblum’s argument: immigration. In the wake of President Trump’s executive orders on immigration, marches and rallies gave many angry people a forum to vent. But when Cardinal Joseph Tobin, archbishop of Newark, cited Exodus (“You shall not oppress an alien; you well know how it feels to be an alien, since you were once aliens yourselves.”) it lent moral clarity to an opposition sometimes blurred by rage. Again, however, there is this inconvenient fact: According to exit polls, Donald Trump did very well among Catholics and even Evangelical Christians. It seems there are many folks out there who want to keep Christ in Christmas, but not necessarily in Christianity. To his credit, Rosenblum is not naive. “The fault lines within the working class are many—gender, education level, race, language, age, ethnicity, sexual orientation and identity, citizenship status—and employers over the years have skillfully exploited divisions among workers to break insurgent organizing,” he writes. Rosenblum reports on an inspiring moment from 2011, when Muslim shuttle drivers at a Seattle-area Hertz—who were members of the Teamsters’ union—were told they would have to clock out when taking a break for daily prayers. “It would have been understandable if union leaders took a pass on the fight...cognizant that the vast majority of their union members...were likely to be quite unsympathetic,” writes Rosenblum. But the union did fight—and won. Still, it is not mere timidity to question whether victories can be replicated, given the hostility immigration generates, at least in some quarters. Perhaps Rosenblum’s argument could have been bolstered by some historical context. The labor movement in America has absorbed various waves of immigrants with different religious and cultural backgrounds. Are there lessons there to be learned today? And in a book about the nexus of faith and labor, a consideration of, say, Leo XIII’s 1891 papal encyclical on labor and capital, “Rerum Novarum,” and how it was received in the United States, might also have provided some valuable insight. In the end, there is no question that progressive thinkers and activists would be wise to build coalitions with religious leaders, even those with whom they disagree on hot-button issues like abortion. Whether the key figure of the election of 2016 was not hyper-capitalist Donald Trump, but instead the socialist Bernie Sanders, still remains to be seen. This article also appeared in print, under the headline "A new path for unions," in the May 15, 2017 issue. Tom Deignan (tdeignan.blogspot.com), a regular contributor to America, is a columnist for the Irish Voice newspaper, and has written about books for The New York Times, Washington Post and Newark Star-Ledger.